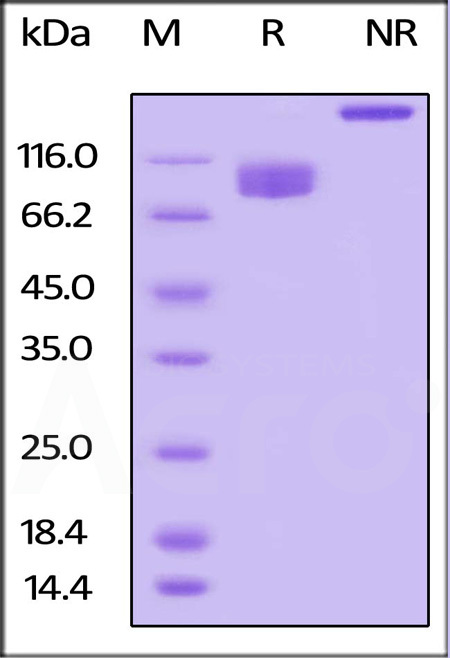 Biotinylated Human LILRB3, Fc Tag (CDA-H82F6) is expressed from human 293 cells (HEK293). It contains AA Gly 24 - Glu 443 (Accession # AAI12199). The protein has a calculated MW of 74.5 kDa. As a result of glycosylation, the protein migrates as 80-105 kDa under reducing (R) condition, and 150 kDa under non-reducing (NR) condition (SDS-PAGE). Biotinylated Human LILRB3, Fc Tag on SDS-PAGE under reducing (R) and non-reducing (NR) conditions. The gel was stained overnight with Coomassie Blue. The purity of the protein is greater than 95%. Leukocyte immunoglobulin-like receptor subfamily B member 3 is also known as LILRB3,ILT-5 or CD85a. LILRB3 plays an role as receptor for class I MHC antigens, which activated upon coligation of LILRB3 and immune receptors, such as FCGR2B and the B-cell receptor. LILRB3 and LILRA6 represent a pair of inhibitory/activating receptors with identical extracellular domains and unknown ligands. LILRB3 can mediate inhibitory signaling via immunoreceptor tyrosine-based inhibition motifs in its cytoplasmic tail whereas LILRA6 can signal through association with an activating adaptor molecule, FcRγ. (1) Bashirova AA., et al., 2014,Immunogenetics.66(1):1-8. (2) Huang J., et al., 2010, J Virol. 84(18):9463-71. (3) Pfistershammer K., et al., 2009, Blood. 114(11):2323-32.